Maureen Bingley (nee Carrington) was born at Jubilee in the late 1930s. She was known locally by neighbours and friends as the ‘Little Heroine’ as at age 15 she nursed her terminally ill mother. In the war Maureen’s dad was in the Home Guard and it was his job to check for any chinks of light showing at the Codnor Park Forge during blackouts, one night he was on the Forge roof when the bombers came over and her mother wept in fear for what might become of him. Murray born at Middlebrook Hill, later moved to Frankin Road, Jacksdale. He remembers the old air raid shelters in the playground at Jacksdale School and how he and school pals would comb the forge site looking for fins left by incendiary bombs and anti radar strips, as tin foil had never been seen before. Outings to the Jacksdale Picture Palace and how Mrs Daykin, the manager’s wife kept order, by whacking the backs of seats with an old chair leg, if any children misbehaved at the pictures. 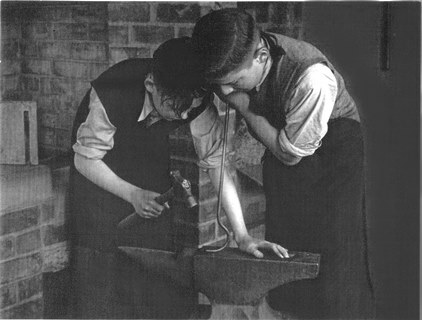 Murray loved woodwork and metalwork classes at Matthew Holland School and the photo above shows Murray on the left, hard at work in class, where they learned how to take apart and re-assemble an old motor bike. Murray’s dream to become a motor mechanic never came true as he was injured in a road accident, so he became a cobbler, instead enjoying the challenge of restoring old pit boots to their former glory.